In a small bowl, combine the yogurt, chopped dates, coriander, cumin, turmeric, lemon juice, water, and a pinch of salt. Use enough water to transform the mixture into a drizzle. Set aside. Stovetop: Fill a heavy bottom pan or Dutch oven with enough oil so that it comes about a ½ inch up the sides. Basically, you need enough oil so that the spinach can float. I have a low-tech method for knowing when the oil is hot enough: stick the end of a wooden spoon in. If the oil starts bubbling around it, it’s hot enough. If the oil starts splattering, however, the oil is too hot. Lower the heat and wait a few minutes to let the oil temperature drop. Once the oil is ready, gently drop a few spinach leaves in at a time, making sure not to crowd the pan or fryer. Wear an apron and keep your distance from the stovetop to avoid burns. After about 30 seconds, remove the leaves with a slotted spoon and place them on a few layers of paper towels to absorb the excess oil. Spread the leaves out so they do not overlap and to keep them crispy. 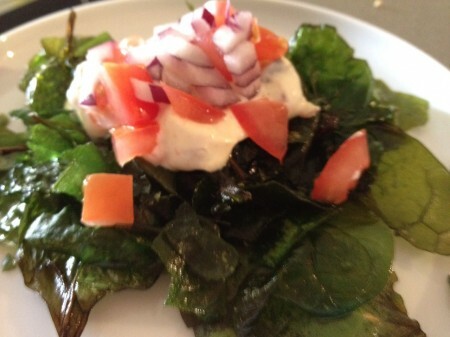 Once you’ve finished frying all the spinach, pile it up on a plate, drizzle with the yogurt mixture, and top with chopped tomato and red onion. Serve immediately. The leaves will not stay crispy for long after they’ve been stacked.